Your partner catches you from the back by the shoulders. Step forward and bend slightly to one side. On the next step bend slightly the other way. Then make a ninety degree turn into your partner. Take your head and the arm that is furthest away from him between his two arms. Keep moving until you feel that he is coming off-balance. Now change your direction by stepping back with one arm coming in the direction of his head. Do not knock him down but steadily push him. Keep your body moving backwards until he falls to the mat. 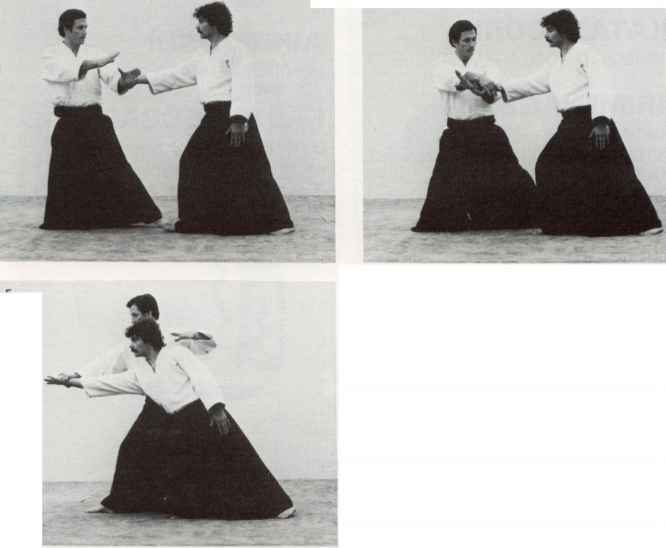 Your partner escapes with a backward ukemi.